Frank (patient name changed for privacy) didn’t like several things about his partial dentures. 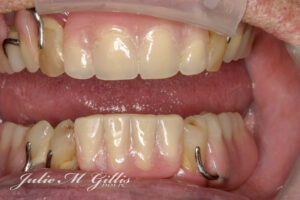 Precision partial dentures were offered as an option to help solve all of these concerns. Because precision partial dentures attach onto existing teeth or even onto dental implants that are stable, your partial will chew more like completely healthy teeth. Several options are available to improve your smile and more importantly improve your chewing comfort even though you are missing several teeth. 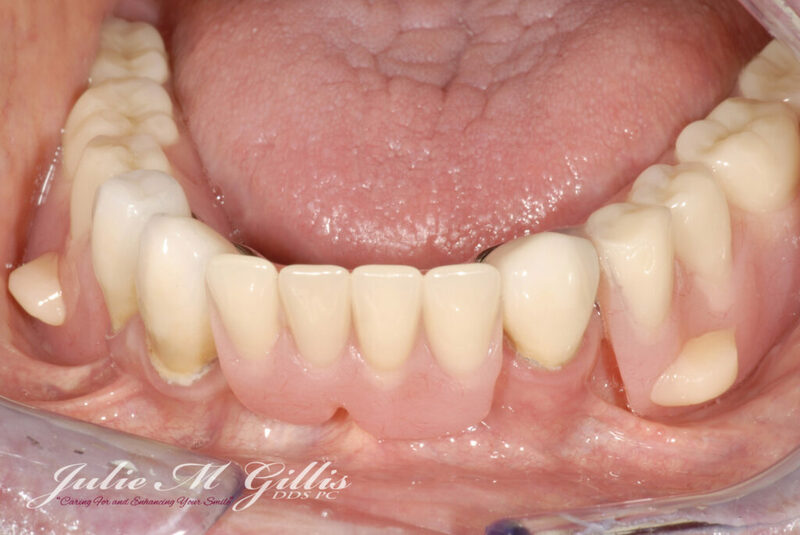 Our patient chose precision partial dentures that fit onto precision attachments that were added to crowns on his remaining teeth. 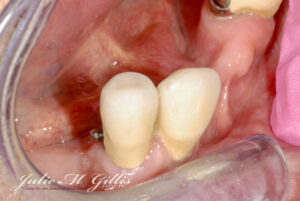 The remaining teeth required crowns due to existing extensive restorations and decay. This was a perfect time to add precision attachments. The precision partial denture will attach to the teeth with specialized nylon inserts that are placed inside the partial denture. 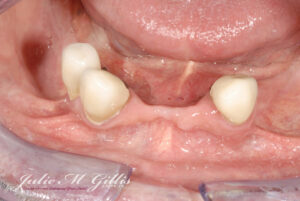 Chewing becomes much more comfortable as the partial does not constantly lift off of the gums. Notice in the photo above how thin the bone is in the area without teeth. 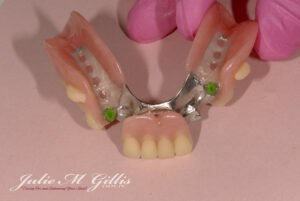 Notice the lack of metal clasp arms to hold the denture in place. So, even though there are only three remaining teeth, with the specialized attachments, the metal arms are no longer needed. 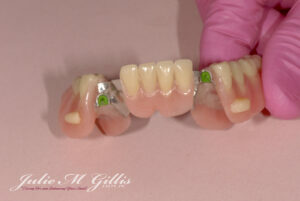 See the green precision nylon inserts inside of the precision partial denture that will fit onto the attachments on the patient’s crowns. In these photos you can see the precision partial denture and the special attachments that fit onto crowns on our patient’s teeth. If you are missing teeth and would like to hear more about your options to replace these teeth, our office would love to tell you about precision partial dentures and other options available today. Precision partial dentures are just one option to replace your missing teeth and help you regain confidence in your ability to eat and feel comfortable and confident about your smile. Sometimes just adding one or two precision attachments can make the difference between a partial denture that you love, and one that you dread to place every day. It is also very important to have a precision partial denture that really fits your mouth, your bite, and your lifestyle. Please call our office in Grand Junction, Colorado at (970) 242-3635 to schedule a consult or a new patient examination or just to chat about your options!